唐少文, 张渊, 陶必林, 杨智荣, 孙凤, 詹思延. Tang Shaowen, Zhang Yuan, Tao Bilin, Yang Zhirong, Sun Feng, Zhan Siyan. Tang Shaowen, Zhang Yuan, Tao Bilin, Yang Zhirong, Sun Feng, Zhan Siyan. Risk of bias assessment: (7) Assessing Bias in Studies of Prognostic Factors[J]. 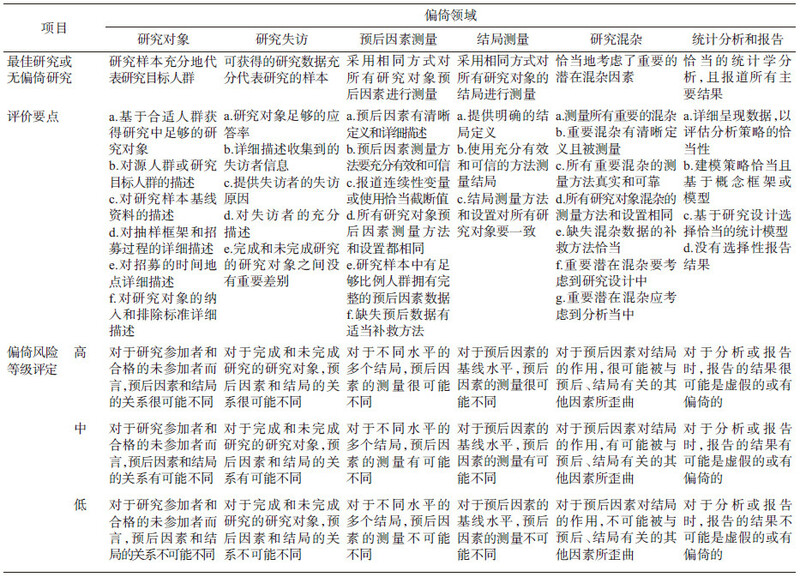 Chinese Journal of Epidemiology, 2018, 39(7): 1003-1008. Abstract: This paper introduces the tools related to Quality In Prognosis Studies (QUIPS) to assess the risk of bias in studies of prognostic factors and the relevant points of assessment and to illustrate the application of QUIPS in published prognostic research. The QUIPS tool identified 6 important areas to consider when evaluating validity and bias in studies of prognostic factors including participation, attrition, measurement on prognostic factors, outcomes, confounding factors, statistical analysis and reporting. It also provided a new method for evaluation on bias in the areas of prognostic research. 杨智荣, 孙凤, 詹思延. 偏倚风险评估系列:(一)概述[J]. 中华流行病学杂志, 2017, 38(7): 983–987.